It took me years to understand upside down cakes. When I first heard the term upside down cake, I had never actually seen one. I must have been about eight years old, and I remember picturing a pineapple cake that was flipped upside down. In my head it was always pineapple upside down cake. I imagined all sorts of scenarios including floating cakes, and cakes with the frosting at the bottom, but the idea of baking a cake and then flipping it to reveal a lush fruit layer never occurred to me. 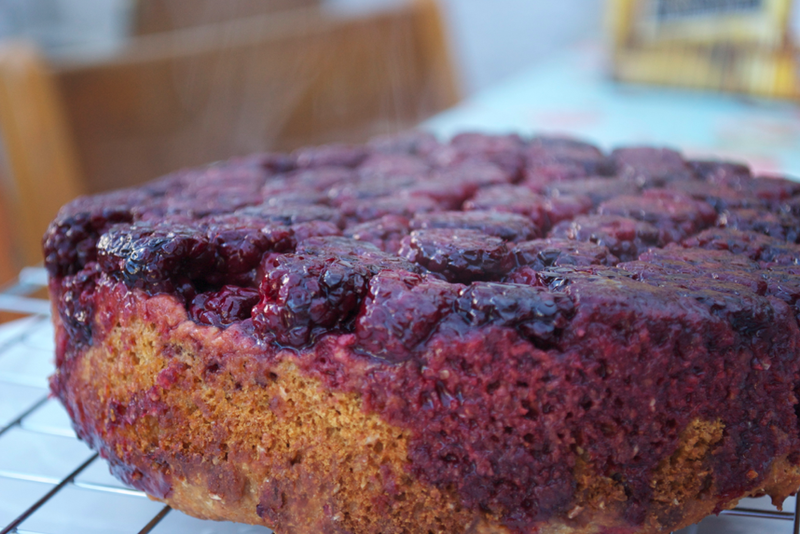 So when I saw Vegan Yum Yum’s Plum Kuchen I knew it was time to make my own upside down cake. This recipe calls for yeast. I’ve never used yeast before (discounting the times when I helped decorate yeasted pizza dough as a little kid) so I was nervous/ excited to try it out. Unfortunately, my dough did not rise that much. Fortunately, I don’t think it matters much with this cake. I will be experimenting more with yeast in the future and will be sure to report back! 2. In a mixing bowl combine Yeast with Flour, Yoghurt, Sugar, Salt, Zest, and Vanilla. 3. Mix for 5 minutes, adding in Butter one tablespoon at a time. Mix until very shiny and sticky. 4. Sprinkle flour on top of dough (don’t mix in). Set aside to rise for 2 hours, covered with paper towels. 5. After the first rise, mix the dough to combine the flour on top. 6. Grease a cake pan with extra Butter or Oil. Sprinkle the bottom of the pan with enough sugar to lightly coat it. 7. Cover the bottom of the pan with the fruit before pouring the dough on top. 8. Cover with an oiled plastic wrap and let sit for 90 minutes. 9. In a Preheated oven (190º C) bake the cake for 35 minutes, until golden brown. 10. Remove from heat and let sit 10 minutes. 11. Pass a knife around the cake pan before flipping cake onto a cooling rack. Let cool before serving.